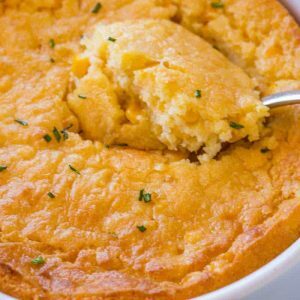 5 Ingredient Corn Casserole in the oven in less than five minutes, it's the perfect side dish for the holidays with almost no effort at all! Grease an 8x8 inch baking pan well. In a large bowl mix all the ingredients together and add it to the baking pan. Bake uncovered for 45-55 minutes or until lightly browned. If desired brush on just a bit of melted butter before serving (optional).